On the day they launched their highly anticipated online store we took Tommy Ton for a perusal of Anthem's beautiful Calvert Avenue store. As mentioned previously, Anthem sources well crafted products from all over the world to provide something of a unique experience for discerning menswear shoppers. In a store full of discovery it didn't take Ton too long to fall for the charms of Kaptial's Boro Western Shirt. Quality, artful and precise. I couldn't resist taking a detail shot before he bought it. 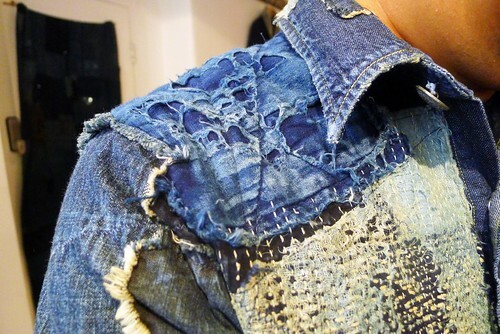 i love patch work fashion.... its so creative, it saves money and it eco friendly!